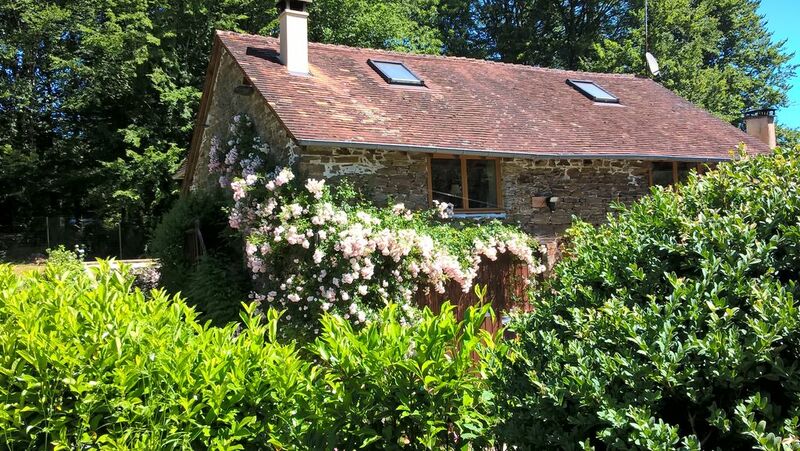 Traditional French farmhouse; 3 bedrooms, 2 bath/shower rooms, large games room. Get away from the hustle & bustle of the UK for the tranquility of the Dordogne. Outdoors you can enjoy secluded places to relax in either sunshine or shade, including a 40m rose walk with seating beneath a willow tree. Above all you get exclusivity, privacy and pure relaxation. Breakfast, lunch afternoon teas and dinner at very reasonable prices are available as an optional extra. Please note that our pricing policy is per person per night. Also note that there are stairs to climb, steps and a slope to navigate. Your own covered outdoor kitchen with gas BBQ, sun shades, new hot tub and lights for those romantic evenings and a fire pit to keep away any evening chill. Free use of 2 bikes, at your own risk, one being electric. A chalet for changing with sun loungers and chairs is close to the pool. It has another gas BBQ, kettle and fridge. Enjoy a leisurely breakfast under a gazebo by the rose-walk and experience the fragrances of Alison's rose colection. My wife and I live in adjacent quarters and are here to help you enjoy your holiday but we always respect your privacy and keep a discreet distance. Exclusive use of the facilities below; A welcome pack is provided on your arrival. A spacious family room with double bed & bunk bed on the ground floor. A double bedroom typically French, also on the ground floor. A newly available third romantic rose-themed bedroom with superking size bed and sink on the first floor. There is an adjacent separate toilet and shower room on this floor. A cosy lounge on the ground floor with unlimited Wi-Fi, UK SKY TV, smart 3D TV and numerous TV box sets. Gym equipment is available on request. We are a young retired professional couple who love the outdoor life in sunny south west France. We love gardening and walking with our two rescue dogs and our relaxing hobbies. These include archery, cooking, spinning, felting and having people to stay! We love the area that has so many interesting and picturesque places locally and the slow pace of life that it offers. We also love to eat al fresco and socialise with our friends and family, playing pool, boule and new French games that we have been introduced is filled with sunshine and pleasures which is proving perfect for our retirement. Come and sample a taste of life in the sun!! We live on the site and keep a discrete distance, respecting your privacy but are always on call for any help or advice. We fell in love with both this property and the area whilst on our honeymoon and immediately bought it. We spent 4 years renovating it and designed it to accommodate our children. It has many outside and inside facilities for relaxation and entertainment. Our prices are constant throughout the season. The house and grounds are very private and we are very proud of our landscaped gardens. Living in the natural forest brings peace and tranquility. The lack of light pollution makes the most of the beautiful star-lit nights. You can enjoy local forest walks without venturing far. Alison loves to cook and can provide any meals as an excellent value option to make life a little easier for you. As well as a well equipped inside kitchenette, there is a comfy outdoor kitchen, with gas BBQ. There are 2 dining rooms; a cosy one which seats 4 people and a characterful, more formal dining room, traditionally furnished and seats 8-10. Exclusive use of a self-contained chalet ideal for those afternoon siestas, barbeques and late evenings around your firepit. There are steps to access the cottage and a staircase inside. Neither are steep. Breakfast, lunch and dinner are available at extra cost. Alison has prepared an extensive menu at very reasonable prices. The cottage is well equipped for both hot sunny weather and those rare rainy days. A lovely relaxing home from home. Alison and Graham make guests very welcome and boy can Alison cook!!! Dear Phil & Jackie, thank you for being excellent guests - thoughtful and considerate. You'd be welcome back anytime. Graham and Alison were superb hosts and we really enjoyed our time in France. We were luckily/unlucky enough to have a power cut which lasted a number of days, but Graham set up a generator so we had power to the TV, fridge and WiFi. The lack of power didn’t spoil our break at all in fact it probably enhanced our experience. Ian and Lisa were delightful guests, leaving the rooms tidy and clean and were very respectful of our facilities. They were very tolerant of the 4 day power cut resulting from one of the Dordogne's rare but fierce storms. Graham & Allison gave us a really warm friendly welcome. The property is an excellent upside down layout. The large lounge / games room being upstairs was very spacious and relaxing looking out over the grounds with a small bar and fridge in the corner (reasonable prices). The bedroom was spacious and the bed comfortable. The bathroom was unusually large with double jacuzzi bath and fantastic shower. The swimming pool was good which Graham cleaned & checked daily and the newly added hot tub was a delight. Plenty of outside seating places to choose from either in the sun, shade under a tree, gazebo or the summer house and the 2 acre private secluded garden is wonderful. I don't know how they find time to keep it so nice they are so un-intrusive yet respond when you need them. With 2 outside gas barbecues to choose from, the small kitchenette or Allison's excellent cuisine this property has plenty to offer for a quiet relaxing holiday. .
Colin and Cath were delightful guests; very respectful of our cottage and facilities. It was a pleasure to share our home and garden with them. We'd love to have them back anytime. Ingrid and her group were good guests. They left the cottage clean and tidy and were respectful of our facilities, which they seemed to enjoy to the full. They would be very welcome to come back. Een erg ruime woning met zwembad (die zelfs in het najaar nog wordt vergroot) en op de bovenverdieping een volledig gevulde speelkamer. Afhankelijk van de leeftijd van de kinderen wordt er gezorgd voor speelgoed van die leeftijd. Graham en Allison zijn er als je vragen of info over de omgeving wilt hebben, maar dringen zich echt niet op. Leuke tips gehad van lokale evenementen. Daarnaast is Allison een voortreffelijke kok en kookt de heerlijkste gerechten met groenten uit eigen tuin. De hottub op het terras was heerlijk. Al met al een echte aanrader! Graham en Allison, thanks You for a wonderfull week! Sander and his lovely family are welcome back anytime. They were very respectful of our cottage, facilities and gardens and left everything very clean and tidy. Thank you for choosing our cottage for your holiday. Alles aanwezig alle ruimte zowel binnen als buiten in een prachtige omgeving. Ook kan je voor een heel zacht prijsje zowel ontbijt, lunch als heerlijk diner door de gast heer en vrouw laten verzorgen. Absolute aanrader.!!!!!!! There is a supermarket with fuel, bank and quality restaurants a short drive away at La Coquille as well as a railway station which provides access to France's extensive railway system. Within an hour's drive, there are picturesque, interesting, historic towns, villages and chateaux and caves with prehistoric cave paintings. A short drive brings you to Jumilhac-Le-Grand with its truly fairy tale chateau which hosts tours in the recently renovated rooms and its beautiful gardens, and shady picnic areas. Slightly further and you'll find Rouffiac resort with a large lake with beach, water skiing on a zip wire, a childrens' adventure ground and a more adventurous challenge in the trees. There are traditional local markets on most days of the week for those seeking a bargain. Perigueux is a fascinating Roman city which merges the old with the new, with ancient alleys and buildings around the spectacular cathedral. A 40 minute drive takes you to Brantome, a beautiful town on the convergence of picturesque rivers. The Friday market there is a must and you can be more adventurous in canoe rides on the rivers. Limoges pottery is available at the nearby Roman town of St Yrieix-La-Perche. Other nearby activities include go-karts and donkey rides. Characterful and historic towns are within a short drive.